(Newser) – The agriculture minister in Brazil's new administration has declared that supermodel Gisele Bundchen, one of the country's most famous citizens, is a "bad Brazilian." Her offense: criticizing deforestation and calling for environmental protections. In an interview Monday, Tereza Cristina Dias accused Bundchen of tainting the country's international reputation with environmental activism, the Guardian reports. "You should be an ambassador and say that your country conserves, that your country is on the global vanguard of conservation, and not go around criticizing Brazil without knowing the facts," Dias said. a 'Bad Brazilian' ??? oy, did he mean the wax? Another trump lookalike demanding people lie. I can't wait for the trumpian de-evolution when all these right wing racist nuts are removed, jailed and legally executed. What can you expect from a regime that makes Trump look half good. 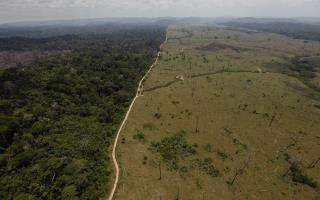 Bolsonaro just eliminated the environmental department and put it under control of the agricultural one. This means big ag will now be in charge of Brazil's environmental future. Disgusting! !